What it is: [Magna-tiles website description] Magna-Tiles® were invented in 1992 to teach children about shapes through play! Each tile has magnets along it’s edges. The secret is the unique ability to attract even when the tiles are flipped. They always connect! Sized just right and easy to use, Magna-Tects develop fine motor skills as they start by stacking, making flat patterns, and 3-D Shapes, and with time, create complex Magna-Tiles® Creations.Valtech llc offers innovative magnetic building tiles designed to hold a child’s interest and attention, build critical developmental skills and promote imaginative play and creativity. Valtech’s Magna-Tiles® are used in schools, childcare centers, children’s museums, and homes around the world. Parents, teachers, and children of all ages love Magna-Tiles®! 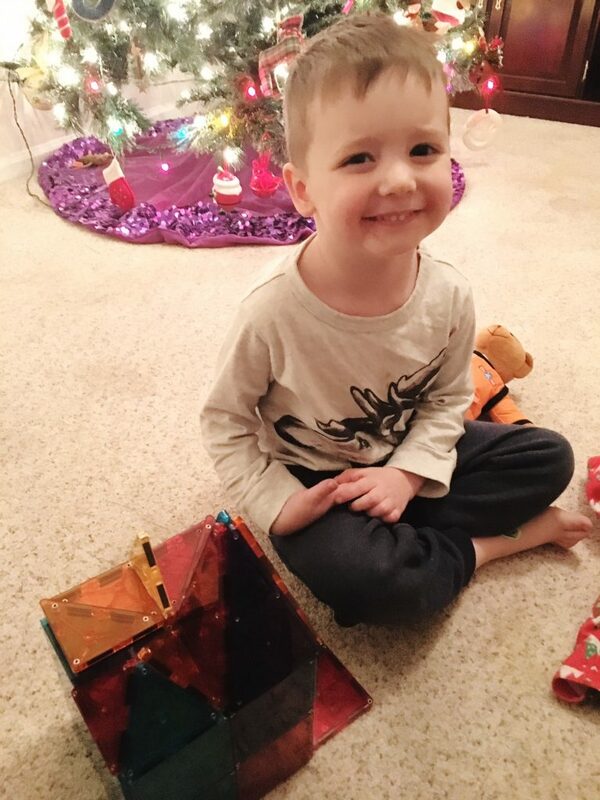 What I love: My son first played with Magna-tiles at preschool, and he comes home almost every day to tell me how much he loves them. He says “I’m REALLY great at magna-tiles, mama.” I love this, because I think they are a great toy to encourage creative play, build motor skills, and increase his confidence. He loves to build rockets and houses and trains with them. They provide him with a ton of ideas for pretend play, as well. They are a daily favorite and even I love to manipulate the shapes. They are a great early geometry/3-D shapes lesson, too. I am always impressed at what he can build and the ways he experiments with shapes and colors. What I would change: These babies come with a pretty high pricetag, which I understand because of all the tiny magnets and their ability to connect on any side. But I wish there was a set size in between 32 pieces (which is around $50) and 100 pieces (which is around $120). I also wish they came with a carrying bag so that we could keep them together without carrying around the plastic box they came in. Seriously one of the best toys my kid has ever received – a great gift to give! Highly recommend.